We supply our insect control services to many different market clients – large and small. Consistent attention to this area is critical for the control of insects. 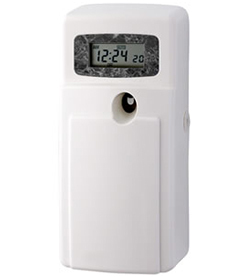 Our insect control unit can be used safely in just about any business. It is a wall mounted unit the same size as an air freshener. It contains the natural insecticide Pyrethrin and is used to control flies, mosquitoes, moths, ants, fleas and other pests. They are serviced by our service technicians and can be programmed to suit your requirements. Our staff are fully trained in the handling of these units and we can offer advice to your staff should they encounter any break out of insect problems elsewhere on your premises.